Strikes from Australian forwards Brooke Peris and Georgie Parker alongside a penalty corner drag flick from Georgina Morgan helped the Hockeyroos to secure their first 3-1 victory over Germany at the TPG International Tri-Series in Singapore on Thursday night. In a productive first half, Northern Territory's Brooke Peris opened the scoring for the Hockeyroos with an on-target strike at the 10th minute mark. Quickly retaliating four minutes later, Germany responded well to Australia’s opening goal with a successful penalty corner opportunity taken by Marie Mavers. Experienced Australian forward Georgie Parker was well positioned in the circle during the 18th minute. Making contact with the ball, Parker quickly found the back of the net and awarded Australia a second goal in order to break the deadlock 2-1. Setting up Australia’s penalty corner battery after the halftime break, Georgina Morgan’s powerful drag flick broke through the German defence, adding to the Hockeyroos' tally 3-1 and securing their first victory of the series. Speaking about the general feel amongst the team with a focus on the younger faces, Commens added, “The team are coping well and I’m really pleased with the younger players and their current performance level. A lot of the younger players have made progress since their opportunities last year and that’s all we can ask of them. The Hockeyroos’ final match will be against the Netherlands at 10pm AEDT on Saturday. The Hockeyroos previously went down to the Dutch 2-0 earlier in the Tri-Series. The TPG International Tri-Series is hosted by The Project Group, a major partner of the Hockeyroos. The Green Machine and Canada met for the fourth and final time of this warm weather series in Cape Town and there was to be no repeat of the 6 goals that yesterday’s match produced. However the 0-0 score-line doesn’t fully reflect the end to end action that ensued with plenty of chances for Ireland. Youth and experience combined for the Green Machine with Robson and Glassey taking to the field alongside Mitch Darling, captaining the side, who earned his 150th cap for Ireland today. Neither team looked like scoring in the first half thanks to well-structured defences and experienced keepers between the posts for both sides. Johnson, the scorer of both of Canada’s goals yesterday, was the first to challenge Fitzgerald with one of his trademark drag flicks but a confident save and subsequent quick clearance by Jackson dealt with the danger. The only goal of the game was disallowed in the third quarter and Glassey was sent to the sin bin for an infringement, sending the Irish down to 10 men for the majority of the quarter. The Green Machine won two corners in quick succession but Carter showed his experience between the Canadian posts, while his defence was quick to clear another Irish effort off the line. The final quarter began with Canada seeing a shot fly wide off the post which was followed by a quick break up the pitch and Mikie Watt drawing a superb save from Carter. Ireland had 2 corners in the final minute but a goal wasn’t to be for either side today as the game finished 0-0. 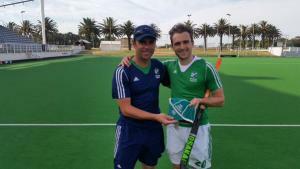 Ireland next face Belgium, world ranked 5th, on Saturday at 12 midday GMT. Squad: Fitzgerald (GK), Gleghorne, Jackson, J Bell, L Cole, Robson, Glassey, O’Donoghue, Darling (Captain), Watt, Sothern, Carr (GK), Harte, Loughrey, Carlisle, Magee, Good, Watkins. Kalinga Lancers kept its cool and gave a better performance to register a come-from-behind 4-2 win over Dabang Mumbai in the Hockey India League (HIL) at the Kalinga Stadium here on Thursday. Adam Dixon and Glenn Turner scored in the third and fourth quarters respectively to erase memories of the host’s disappointing loss to Uttar Pradesh Wizards in the opening match the other night. Florian Fuchs’s goal had put Mumbai ahead early in the third period but the tourists could not sustain the pressure and went down fighting. Guided by Moritz Fuerste and Aran Zalewski, Lancers pressed from the beginning and invaded the Mumbai citadel on several occasions. However, it could not get any breakthrough due to Mumbai’s compact defence, led by Matthew Swann and Jeremy Hayward. Besides, an agile and athletic David Harte under the bar also frustrated the Lancers’ forwards. While Lancers tried to overcome their finishing issues, Mumbai continued to impress with its excellent structure. A surprise goal boosted Mumbai in the 35th minute. 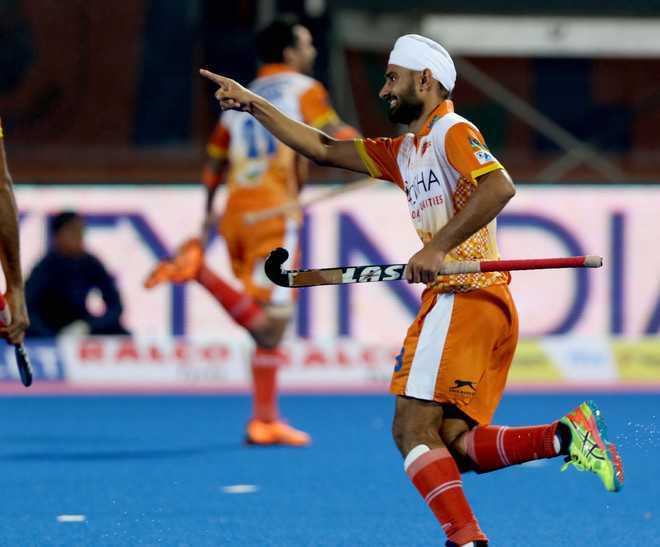 Gurjant Singh’s sharp top-of-the-circle reverse hit was blocked by Harte and an unmarked Fuchs tapped in the rebound to silence the noisy stadium. Lancers never gave up despite failing to cash in on their second penalty corner. It required a precise cross from Malak Singh from the left and Dixon’s crisp shot to equalise at the stroke of the third break. Mumbai, which could not benefit from its three short corners, started feeling the pressure. Sensing a chance, Lancers pushed hard and succeeded in getting the winner through a magnificent effort by the seasoned duo of Turner and Fuerste. On a counter-attack, Turner sprinted up the right flank and had a quick exchange with Fuerste to beat the rock solid Harte and slot it in. Lancers’ back line, aided by some good work from Amit Rohidas, held its nerve and its players up the field showed better ball control in the final minutes to earn crucial points. “We were smarter near the attacking circle and created a lot of opportunities. We took the goalkeeper out of the game a little bit and opened up a bit of angle to shoot [the goals],” said Lancers coach Mark Hager. The result: Kalinga Lancers 4 (Adam Dixon 2FG 45, Glenn Turner 2FG 51) bt Dabang Mumbai 2 (Florian Fuchs 2FG 35). The much awaited victory dawned for the hosts Kalinga Lancers today with the winner, a stunner of a shot emanating from hardworking and opportunistic Glenn Turner in the fourth quarter to give 4-2 win over another struggling outfit Dabang Mumbai. After two teams tied at 2-2 after prolonged spells of attack, Glenn Turner gave the winning moment for Kalinga after latching on to a rebound off goalie David Harte, and then guided the slow balls into the far corner of the open goal (4-2). This was the moment the Kalinga have been waiting, and the crowd which was silenced when Florian Fuchs struck the first goal of the day, came alive. Mumbai, another team in remoulding, and which it did not do well in the last three editions, attacked with verve in the three quarters, but poor finish inside the circle and wasting of penalty corners undid it. Harmanpreet, who was later declared Emerging Player of the Day, took two penalty corners but could not provide surprise, while another one was wasted on account of poor stopping of the pushed ball. Much credit for keeping Kalinga forwards at bay should go to Dabang's goalie Irishman David Carte, who came up with sterling performance today, covering all angles of entry, and thus frustrating the home side. It was in the 35th minute Dabang Mumbai struck their only goal through star forward Florian Fuchs. Kalinga Lancers fought back and equalized in the 45th minute through Adam Dixon (2-2). Then came the feat of Glen Turner. BHUBANESWAR: It neither was an exhilarating display of skill nor an extravagant show of technique. For the Kalinga Lancers, it was sheer resilience that saw them notch up their first win of the 2016 Hockey India League. The Lancers extended their five-match winning streak against Dabang Mumbai by beating Jay Stacy's boys 4-2 (2-1 on goals) at Kalinga Stadium on Thursday. While Florian Fuchs gave the visitors the lead, the hosts hit back through Adam Dixon, before finding the winner through Glenn Turner. The home team wasted little time in shifting gears as forward Glenn Turner made an unchallenged run through the middle before playing it through for Stanli Minz on the right of the goal. The Odisha player's shot, though, was blocked ably by Mumbai goalkeeper David Harte. With Dabang Mumbai trying to set the tempo with possessional play, the Lancers once again seized the initiative via a superb one-two between Minz and Dutch midfielder Quirjin Caspers, in front of Harte's goal. The Dutchman, however, lost his footing under challenge from the Mumbai custodian and his shot soared above the goalpost. Mumbai lost no time in mounting attack on the Lancers goal after the stipulated time-out, to finally the break the deadlock. The Lancers, who had lost their opening match 6-8 against Uttar Pradesh Wizards on January 18, rallied from one-goal deficit after Dabang Mumbai had taken the lead through Florian Fuchs in the 35th minute. Kalinga Lancers bounced back from their opening match loss as they beat Dabang Mumbai 4-2 in a closely contested Hockey India League (HIL) game at Bhubaneshwar on Thursday. The two sides were goal-less at the half time but scored thrice in the next 30 minutes, all field efforts with each strike counting as two under the new rules. The Lancers, who had lost their opening match 6-8 against Uttar Pradesh Wizards on January 18, rallied from one-goal deficit after Dabang Mumbai had taken the lead through Florian Fuchs in the 35th minute. The home side restored parity in the 45th minute through Adam Dixon before Glenn Turner struck what turned out to be the winning goal in the 51st minute. With the win, the Lancers have secured six points from two matches, the same as Jaypee Punjab Warriors, to occupy the top of the table. This was the opening match for the Mumbai side. A win fetches a team five points while a draw counts for two points. A team which loses with a goal difference of two or less will get a point while no point will be given for a side which loses with a goal difference of three or more. The match began on a fast-pace note and both sides attacked vigorously without any goals. Both the goalkeepers found themselves busy, pulling off some good saves. The match continued to remain in a stalemate at the half time though both teams played some entertaining hockey. This was the first time in this edition that there was no goal till the second quarter. An alert striker Florian Fuchs gave Mumbai the lead through a field goal as he tucked in the rebound in the 35th minute. The Lancers struck back in the final minute of the third quarter through a stunning field goal by Dixon and an action-packed third quarter came to an end with both teams finding themselves in a 2-2 deadlock. Egged on by the partisan home crowd, the Lancers put constant pressure on the visiting Mumbai side in the last quarter and it finally paid off. The home side scored in the 51st minute through Turner with captain Moritz Fuerste setting it up to notch up their first victory of the tournament. Bhubaneswar: Kalinga Lancers beat Dabang Mumbai 4-2 to register their first victory in the Hockey India League (HIL) here today. German striker Florian Fuchs’ field goal handed Mumbai a 2-0 advantage but two field strikes from Kalinga’s Adam Dixon and Glenn Turner sealed the deal for the hosts. To begin with, both the teams played defensively, not willing to give any room to the other. Already under pressure following the last-minute defeat in the inaugural match, the hosts tried to stick to their gameplan even as Mumbai enjoyed a greater ball possession in the first quarter. The first quarter, though, remained goalless as both the goalkeepers pulled off some good saves. In the second quarter, Kalinga stepped up the pace a little bit and made some good moves. The Mumbai goalkeeper, David Harte of Ireland, however, thwarted all their attempts. The Mumbai strikers, too, made some attempts but failed to beat the rival goalkeeper. In the 35th minute, in the third quarter, Fuchs scored a field goal for Mumbai. It was an opportunistic strike — the goalkeeper failed to clear the ball and Fuchs made full use of the loose ball. A few minutes later, the visitors earned a penalty corner, but the Kalinga goalkeeper padded away Harmanpreet Singh’s flick. Towards the end of the quarter, the hosts made a strong comeback when Englishman Dixon deflected the ball home to level the score. With their confidence up after getting the equaliser, Kalinga pressed hard for a winner. They got it early on in the fourth quarter when seasoned Australian striker Turner found the back of the net after receiving a pass from his captain Moritz Furste. Mumbai did their best to catch up but the hosts didn’t buckle under pressure and held on to the lead till the end. This year’s Hockey India League showcases some of the world’s best players, including 25 Australians across six different teams. Within a six week stint, the Australian players will immerse themselves into the Indian culture, training and playing with foreign teammates, coaches and support staff in the hope to secure the prestigious 2016 Coal Hockey India League title. 22-year-old Dylan Wotherspoon was signed by Dabang Mumbai for $35,750US after injury prevented Kieran Govers from playing. A rookie in the Hockey India League, Wotherspoon will join experienced teammates Andrew Philpott, Jeremy Hayward and captain Matthew Swann as well as Australian Head Coach Jay Stacey in the 2016 Dabang Mumbai kit. Read about his experience playing in India below. Hockey Australia [HA]: What are you most looking forward to in the 2016 HIL? Dylan Wotherspoon [DW]: I’m looking forward to playing in front of the Indian crowds. The stadiums are always packed to the rafters with the world’s most passionate hockey fans. HA: As a new player into the league, what has been your biggest challengs while preparing/training in India? DW: The hardest thing is knowing what to expect while traveling on the road for six weeks, packing is also a challenge as you’re always sure to leave something at home. HA: What has been the coolest/weirdest thing about playing in an overseas league? DW: I’d have to say the way they treat you. India love hockey which means they automatically love you, the fans look up to the players like they’re movie stars. HA: Who are you tipping to be this year’s winner? DW: Dabang Mumbai of course. HA: Which player should we be looking out for in your team? DW: German striker Florian Fuchs, I’ll be joining him on the forward line. HA: What does a day in India look like for you? DW: Wake up; gym; breakfast; stretch and roll; coffee brew up in our room; on-field training; pool/ice bath recovery; lunch; team meetings; rest; second training session; video analysis; massage; dinner and then finally bed. BUKIT Jalil Sports School (BJSS) Thunderbolts aim to bounce back in Division One, when they meet Petaling Jaya City Council (PJCC) in the Malaysian Junior Hockey League Friday. BJSS have a well balanced team, but wasted sitters and a penalty stroke as well when they went down 2-1 to SSP-MSP- Thunderbolts last Sunday. "The defeat was a lesson well learnt by mu players, as being in control of the match means nothing if they do not tuck in the ball more frequently. We missed too many sitters, and also a penalty stroke to lose three vital points last Sunday. "We have been training hard since to rectify some of the problems and hope to secure three points from PJCC tomorrow (today)," said BJSS Thunderbolts team manager K. Rajan. PJCC have full points by beating Nur Insafi 3-1 and Olak Tigers 2-0. "We have watched videos of both the PJCC matches, and my players know what to do and what not to do. It wont be an easy match, but we aim to bounce back to keep in touch with the leading pack," said Rajan. RESULT: Division Two Group C: Pahang Hockey Academy 0 Sabah Sports School 4. Division One -- FRIDAY: SMKDBL Young Guns v UniKL Young Guns (Batu Pahat), Politeknik v Nur Insafi (Taman Daya), PJCC v BJSS Thunderbolts (National Stadium), SSTMI Thunderbolts v Olak Tigers (SSTMI), SSP-MSP- Thunderbolts v SSTMI Juniors (Kuantan). SATURDAY: SMKDBL Young Guns v Olak Tigers (Batu Pahat), Politeknik v UniKL Young Guns (Taman Daya), SSTMI Thunderbolts v Nur Insafi (SSTMI). Division Two: FRIDAY (Group A) -- Penang-USM v Matri (Sg Petani), MSS Kedah v MCKK (Padang Serai), Perlis Young Lions v Kedah Juniors (Kangar). Group B: Anderson Thunderbolts v STAR (Azlan Shah I), Felda Juniors v MISCF-UFL (Azlan Shah II), BJSS Juniors v MSNPK-ILHC (MInistry of Education). Group C: Pahang Hockey Academy v Datuk Taha (Temerloh), Malacca High v SM Sains Johor (Malacca II), Young Hurricanes Malacca v SMKDBL Juniors (Malacca I). SATURDAY: Group A: Matri v MCKK (Kangar), MS Kedah v SM Sains Azlan Shah (Padang Serai), Penang USM v Perlis Young Lions Juniors (Sg Petani). Group B: MSSWPKL v MSNPK-ILHC (Ministry of Education), Anderson PHA v STAR (Azlan Shah I). Group C: TBSS Tampin v Sabah Sports School (Seremban II), Young Hurricanes Malacca v SM Sains Johor (Malacca I), Malacca High School v SMKDBL Juniors (Malacca II). NOTE: All matches start at 5pm. ISLAMABAD: Ex-prime minister Mir Zafarullah Khan Jamali’s tirade against Pakistan Hockey Federation (PHF) at the National Assembly last week has finally stirred up the federal government which has now decided to conduct a special Audit of PHF fiscal year 2014-15. Federal Minister for Inter Provincial Coordination, Mian Riaz Hussain Pirzada on Thursday directed the ministry to request the Auditor General of Pakistan to conduct a Special Audit of the Pakistan Hockey Federation for the Fiscal Year 2014-15, at the earliest. Pirzada has also directed the chief finance and accounts officer of Ministry of IPC to conduct Internal Audit of Pakistan Hockey Federation (PHF) for the same period. The issue of PHF accounts was discussed in the National Assembly of Pakistan last Monday wherein, Jamali had expressed serious reservations regarding utilisation of funds by PHF officials. Pirzada, while giving directions to the concerned officials of the ministry, reiterated his commitment towards ensuring transparency in the matters of all sports federations. He said that hockey is the country’s national game and the Ministry of IPC is trying its best to streamline the PHF affairs in order to help regain the lost glory of Pakistan.